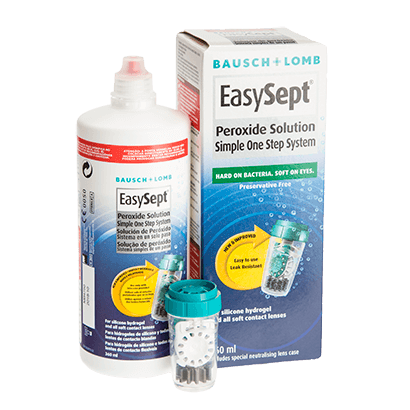 EasySept Solution is an impressive hydrogen peroxide solution that works to clean and condition contact lenses. Made with 3% hydrogen peroxide, this gentle solution is the perfect choice for anyone with sensitive eyes. EasySept contact lens solution is suitable to use with all soft contacts and is provided alongside two a specialised contact lens case that contains a neutralising disc. All you need to do is place the lenses inside the special basket, fill up the case with solution and leave overnight. The solution then works to remove the build-up of protein, dirt and other bacteria on the surface of the lens. As a result, they’re kept clean and clear, ensuring a comfortable and hygienic wear the next day. The case has been designed to neutralise the hydrogen peroxide solution after disinfection, meaning that you can be sure you’re applying safe and clean lenses the next morning. Clean and store your monthly contacts or two weekly lenses overnight, every night, with this impressive peroxide solution. This supply is intended to last for a month, however we also sell an EasySept Solution Triple Pack. From past to present a brilliant solution for cleaning all soft contact lenses. My first go to if wearing anything other than dailies. Only been using for the last 16 days but so far so good.